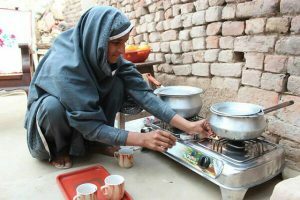 ISLAMABAD, Apr 17 2019 – Pakistan, which has been listed as the 7th most vulnerable country affected by climate change, is now seriously tackling the vagaries of weather, both at the official as well as non-official level. Pursuant to an initiative launched by the Pakistan Parliament’s Upper House, the Senate, which specially entrusted a sub-Committee of the Standing Committee on Climate Change to focus on “Green and Clean” Islamabad, media, civil society and students have taken up the cudgels on combating climate change. On April 10, over 500 students and faculty of one of the prominent universities of Islamabad, COMSATS, launched the “Say No to Plastics” campaign which includes distribution of flyers underlining hazards of plastics use, backed by a door-to-door awareness campaign as well as cautioning against plastic littering. This is just one component of the campaign against environmental degradation in Pakistan, the seeds of which were planted in 2014 when a similar Senate sub-Committee declared the “Right to a clean, green and healthy environment” as a fundamental Human Right. That sub-Committee also published Pakistan’s first Media Manual on Environmental Degradation and Climate Change. This was the outcome of the first-ever Public Hearings on environment and climate change in Pakistan’s parliament which incidentally is the first Green Parliament in the world since it is powered by solar panels, a gift from China. According to experts, Pakistan has faced around 150 freak weather incidents as a result of climate change in the past 20 years: flash floods, smog in winter, forest fires in summer, melting glaciers, freaky heatwaves, landsides, displaced population, etc. During floods in 2010-11, almost 10% of Pakistan’s population was displaced in 2 provinces, one in the North and another in the South. Last year, the costs of extreme weather as a consequence of climate change, were listed at $ 384 million and in the past 20 years, there has been a cost of almost $ 2 billion to the national economy because of the ravages of climate change. Efforts are being undertaken to mitigate the problem. For instance, some $ 120 million funds have been expended in the country in the past 5 years to arrest forest degradation and to promote tea plantations . There has also an effort to bring about a more eco-friendly energy mix for Pakistan. Pakistan has an installed capacity of over 30,000 MG of electricity. Out of this, 60% is being generated through imported fuel including furnace oil, coal etc. while 30% is via hydropower, 6% nuclear and only 4% generated on renewable energy. The share of renewable energy would be enhanced to 25% of the total by 2025 and 30% by 2030. In this context, an interesting conference convened in the last week of March in the picturesque British countryside retreat at Wilton Park, organised by the Climate Parliament, a UK-based body promoting cooperation on climate change among parliamentarians. A large number of parliamentarians from Asian countries like Afghanistan, Bangladesh, Nepal, India, China, Japan, Pakistan and Mongolia participated, as well as leading renewable energy experts plus the International Solar Alliance. Termed as the Green Grids Initiative, the purpose was to discuss and educate the participants on steps that need to be taken for a “renewable-powered planet”. The focus was also on regional grid interconnectivity so that regions can promote cooperation in renewable energy. An interesting side event to this conference was a comprehensive briefing on promoting “Green Cooking”, since fuels such as wood, charcoal, coal and kerosene are amongst the climate pollutants emitted from traditional rural area cooking in most Third World countries. Globally, up to 25% of black carbon emissions come from household cooking, heating and lighting. In many Asian and African countries, household cooking can account for as much as 60-80% of black carbon emissions. Therefore, the efforts to mitigate the consequences of climate change and environmental degradation also require an easily accessible industrial and technological approach that would make clean cooking accessible to the 3 billion people who live without it. Among the initiatives for the way forward proposed at the meeting at Wilton Park, was the need for a special bank for renewable energy similar to the special bank established for infrastructure, the Asian Infrastructure Investment Bank (AIIB), so that availability of capital serves as an opportunity to promote renewable energy . That would be an incentive for developing countries to promote easily available renewable energy in their energy mix. Another proposal that emerged in the context of South Asia was to implement the already existing SAARC Framework Agreement for Energy, which focuses on electricity, signed by all members of the South Asian Association for Regional Cooperation (SAARC) in 2014. While there are bureaucratic bottlenecks plus issues of capacity and legality, what emerged from the discussion was also the need for the right vision and political will to take this battle for a green economy forward. Political conflicts serve as an impediment for regional energy cooperation while influential lobbyists like the Oil Lobby serve as a roadblock against renewable energy utilization. For decades, for instance, Pakistan was hostage to imported oil with a whopping bill of $ 20 billion per annum, while little or no effort was undertaken to look at cleaner or cheaper sources of energy. The key role in this context is, therefore, both of parliamentarians in providing the vision and the will as well as media and civil society to promote greater awareness and expose machinations of powerful vested interests. It is heartening that in the context of Pakistan, there has been accelerated citizen activism like the “Say No to Plastics” campaign. In the past five years, citizens and parliamentarians of Islamabad have gone to the Supreme Court against attempts by builders and the construction lobby to alter the master plan of Islamabad, against the cutting of trees and building of high rises on green areas to benefit the real estate lobby. In both instances, the Supreme Court upheld the citizens plea to preserve, protect and promote a clean and green environment in Pakistan’s Federal Capital, Islamabad, which is relatively young at a little over 50 years, sprawling among the green hills that make it one of the most beautiful capitals of the world. The good thing is that the battle to combat Climate Change has now been taken up by not just the government but the people, civil society, parliamentarians, media and concerned citizens, who have organised themselves for this cause including such proactive group of professional women volunteers who call themselves “Green Force” to lobby on environmental issues, which gives hope that this battle can and will be won in a country that is faced with some of the gravest challenges to its future due to climate change. *Mushahid Hussain was Bureau Chief of the Inter Press Service (IPS) during 1987-1997 & in 2014, he launched the first Public Hearings on Environment & Climate Change in the Pakistan Parliament. As Senator, he chairs the Senate SubCommittee on ‘Green and Clean Islamabad’ which has launched a campaign to ban plastic use in the Pakistani capital.